Mike Axelrod had a great presentation, “The Flags of the Confederacy.” His program focused on the American roots and iconography of Confederate symbolism in its flags. By showing examples of flags from the independent republics (seceded states before they signed the Confederate Constitution), the three national Confederate flags (with variations), and many, and many regimental flags, Mike gave us a great, interesting, and educational presentation on a part of American history. If you were not there, you missed a great program. 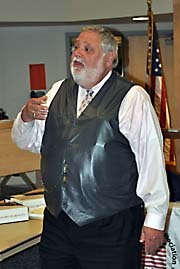 Mike Axelrod taught social studies for many years before becoming a school administrator. As the latter, he served in various capacities ranging assistant principal at middle and high schools, to disciplinary referral officer, to crisis manager for schools and school districts. For the past twelve years he has been President of the Charter School Institute, a non-profit organization dedicated to designing and creating charter schools. To date, the Charter School Institute has raised over two million dollars in grants and designed three schools. In addition to his teaching and school administration certifications, Mike also holds a Pennsylvania associate real estate broker’s license. In this parallel career path he has served as vice president of The Michael Laurence Company, a real estate holding company, and on the board of trustees of HAPCO, the Homeowner’s Association of Philadelphia. A lifelong patriot, Mike serves on the Philadelphia Area Army Civilian Advisory Board and is a military history specialist, curator, and trustee for the Veteran Guard, Third Regiment Infantry, of the National Guard of Pennsylvania. Mike also has a passionate interest in the history of American flags and banners. Currently he is Vice President for Development and Educational Programing for the Philadelphia Flag Day Association. 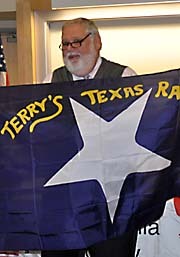 Beginning in February 2007, the Association began collecting historic American flags and banners, going as far back as 1861. This entry was posted in Meeting archive on October 17, 2012 by hlj.